Im not trying to impress you by lieing about my skin condition and let you adore me more. NO, i am not that kind of person who weaning over such perfection and make you feel like less lucky. I have my battle over my skin and as a writer i have such a huge curiosity upon anything new, more over when people keep talking and praising over it. Well this time i have to swallow big dissapointment and say sorry to my skin. After having a month full of trying and observing i am briefly declare this product is TOTAL FAILED TO MY SKIN ( as it produces wonderfull improvement on other’s but unfortunately not mine). 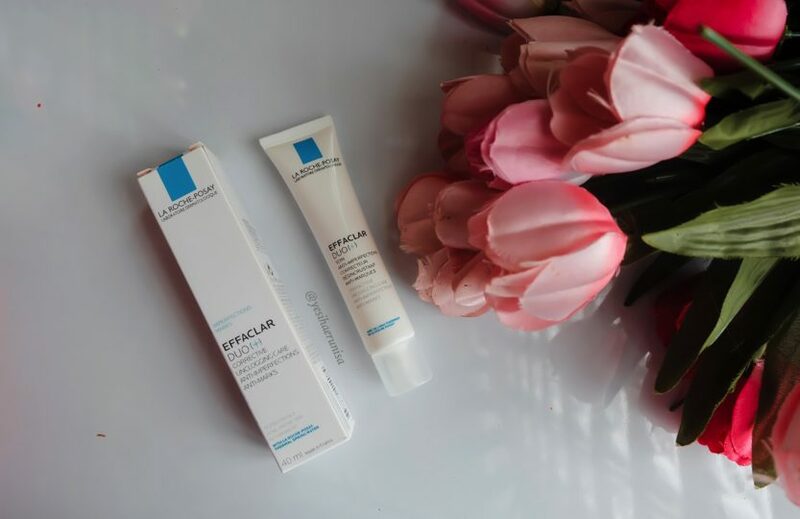 It is begin when everyone talk about this powerful La Roche Posay Effclar Duo initiate by Kiki Siantar or well known as MmeHuillet on instagram. I really look up on her because she’s always come up with great tips and true experience about anything. So after having my mini research i decide to give it a try to my skin at the begining of this year. I am double check on everything after people arguing their have different result. So here i am also not blaming anyone else but point out this is not work well in my skin. I have that white head problem over my face even tough not always have it actually, but as person i expect to do something more for my skin. So then i buy this one and make sure you can purchase it also from my online shop later. For information La Roche Posay is a skincare product based in France and their product is usually being recommended by dermatologist to use by their patient back then in France. One moment Kiki praise about how this product change her skin and that moment BOOOOM everyone craving about it. There are two type actually one with SPF and another one without it. so bacically you can choose wether you want to use it day and night or just for day (with SPF). In one post she also noticed us that the production of this LRP (La Roche Posay) Effclar Duo is in US and France so be sure to buy one made in France that you will have the great result like everyone has if you are having the US one you do not have to use it all over your face but the only on affected area you want to apply. First week of using my face getting that purging like my skin just getting worse everything come out from my skin i try to be patient and have positive mind but it won’t stop after i used it for another week. I just keep believing perhaps its like detoxifying your face before it’s gone. But after hit even weeks 4 the purging is not getting any better. Even more it add me few more acne on my porehead and rash on my side cheek. Then at that point i am realize this not gonna work this way and just adding another problem to my skin that never been seen before. I even check the product i use and it is made in France seriously, because i bring it along the way from UK. My skin is usually like the strongest one, it never give me any complain when i try something new. But for this one it scream so loud that put me to believe i have to give up this time. So for you all LRP fans i am sorry to say this is not work for me. That’s the result of my bad experience of having this on my skin but i do hope you’ll have different result. Share if you have different thought below.